If you’ve heard the term “family engagement technology,” but aren’t quite sure what it is, we’re here to explain! – Connects Senior Care residents with their families. – Preserves memories, milestones, and stories that families can pass down through the generations. – Improves communications for senior communities, their responsible party networks, and the markets they serve. HeartLegacy’s family engagement platform achieves these goals in two ways: 1.) intuitive video; 2.) private family networks. With HeartLegacy, Senior Care residents easily record and send daily video messages to their loved ones (“Videograms”). These messages are typically under a minute in length and cover events like birthdays, anniversaries, holidays, well-wishes, etc. Senior Care residents can also record video messages that recount memorable events in their lifetimes (“Legacy Messages”). These video messages are longer in nature and capture select milestones. Families preserve and share these videos on their private HeartLegacy family networks. In addition to improving resident-to-family connections, HeartLegacy’s technology also enhances community-to-family communications. Activity Directors can distribute important content–activity calendars, upcoming events, announcements–via the secure HeartLegacy responsible party network. Marketing Directors can easily capture video testimonials that document the unique characteristics of their community. These engagement efforts strengthen bonds with the families of residents and diversify market outreach. 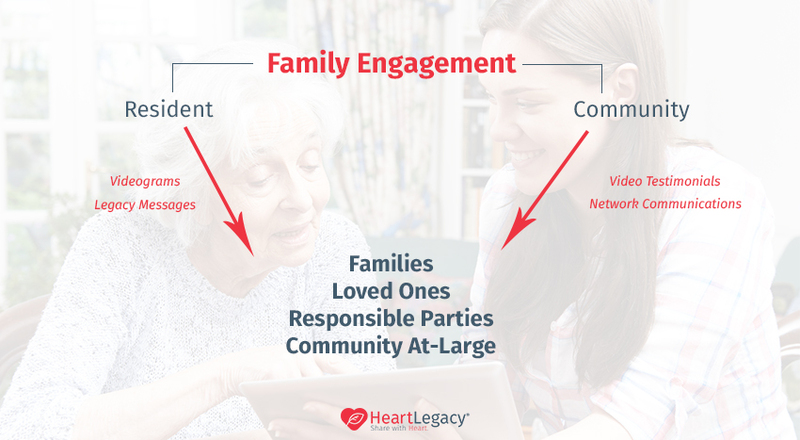 Using HeartLegacy’s family engagement solution, Senior Care communities more effectively uphold their digital obligation to the residents and families they serve. To learn more or to schedule a product demonstration, please click here.